Mini Contactors: 9Amp: Non-reversing, reversing, overload relays, control relays, open starters, accessories. The JM family of mini-contactors and the JM family of control relays offer the user and equipment designer a compact, reliable and versatile solution to today’s demanding requirement of high performance in a confined space. In such applications, PLC compatibility is playing an ever-increasing role. 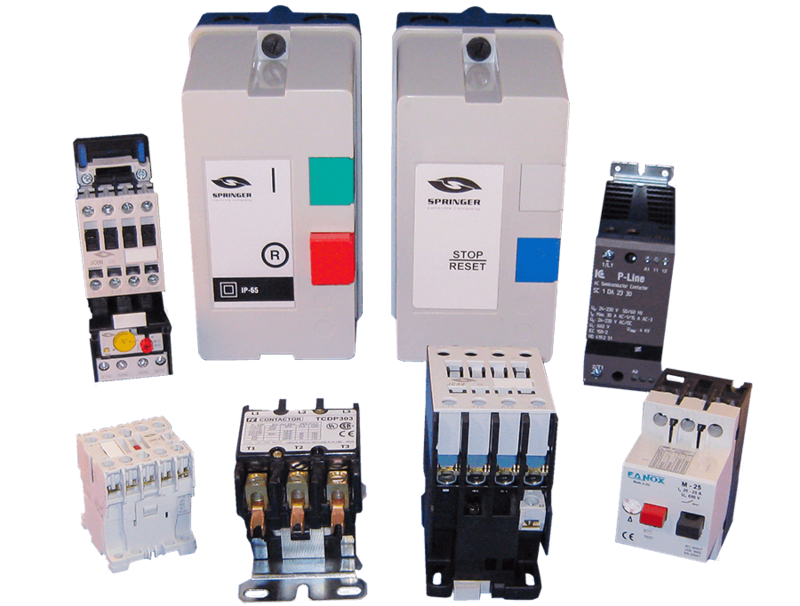 Contactors and control relays are available in either AC or DC controlled forms, and offer application flexibility through a wide variety of modular accessories. Standard IEC Contactors 9 Amps through 700 Amps: non-reversing, reversing, overload relays, control relays, open starters, accessories. IEC Contactors are most commonly used to switch motor loads in applications where running over current protection is either not required or is provided separately. Contactors consist of a magnetically actuated switch which can be remotely operated by a push button station or pilot device such as a proximity switch, limit switch, auxiliary contacts, etc. Standard contactor components are loaded with features that make them easy to install, allow more flexible configurations, lower inventory requirements, and make better use of panel space – and their performance is second to none. • Power circuit (AC): up to 690v. • Screws protected against accidental contact in accordance with VOE 0106. • Full complement of accessories; overload relays, auxiliary top and side mount contacts, mechanical interlocks, electronic timer blocks, pneumatic timer blocks, pole terminated protection. • AC coils (both 50 Hz and 60 Hz versions) and DC coils are available for a wide range of voltages for flexibility.